I have adapted this recipe from her cookbook.As I was bored of eating my regular stuff and I wanted to try something new and hence one day I went through all the cookbooks I had.This recipe caught my attention because of the different medley of ingredients used in the recipe and hence gave a trial immediately for the dinner on the same day.It was nice to have that just for the variation from the regular stuff and infact its a healthy one.Though it is not the stuff which can be prepared for parties ,its worth trying once at home for our regular breakfast/lunch/dinner.I am just reproducing the recipe as it is mentioned by her. Rinse rice flakes in water until clean.Squeeze and keep it aside. Grind all the ingredients under grind section to a fine paste. Boil water in a pressure pan,add soya flakes and cook for 1 whistle. Drain it,and add cold water and squeeze it. Heat oil,ghee in a broad pan.Add bayleaf, masala ingredients and then saute onion. Add ginger-garlic paste,squeezed soya and stir fry. Mix capsicum,carrot,cabbage and stir fry in high flame. Add chopped tomatoes,ground paste and saute for few minutes.Add squeezed rice flakes,salt and stir fry. Serve hot with desired raitha and chips/fryums. 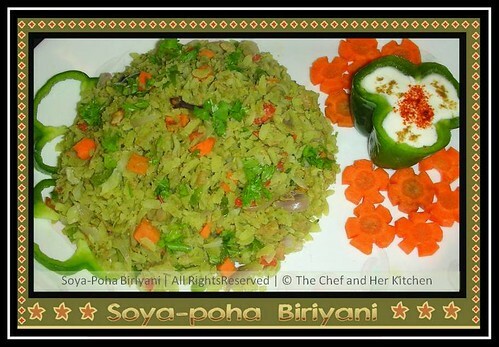 Thats a nice idea to include soya and with poha,its easy to make too,presentation is cool,esp. raita in capsicum!! Making avalakki as biriyani is a brilliant idea Prathy..tat platefull of biriyani looks yummy! 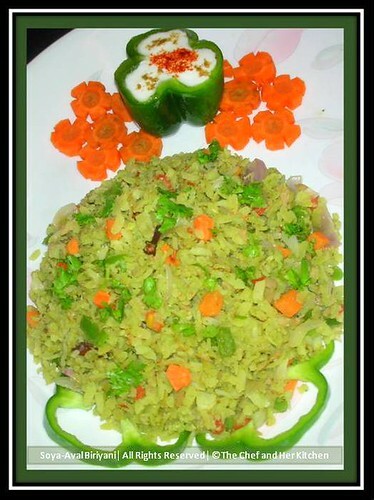 Wow Prathy, Wat a healthy, delicious and yummy briyani dear! Looks amazing and very creative combo! this looks extremely delish and creative!! awesome and fantastic babe, love it!!! That's such a new dish, looks great.. I remember watching Mallika Badrinath's shows when in India :-) - Great Recipes! Thats a unique biryani for sure..i havent dared to think about such a dish..so healthy and lovely..
love this one..gr8 for breakfast..
Looks so good prathy i too do poha briyani but haven't added soya to it , its healthy hah. Great presentation.. looks yumm with capsicum raita cup.. Feeling hungry now. Please accept the award and a tag from my blog. very Healthy and simple recipe, can be good for breakfast too. hmmm. looks good..need to ceck out what Soya flakes is, do you think I will find it in a regular supermarket? Looks so awesome dear. And as usual nice presentation. I was very intrigued by the name of the recipe before I came here to check it out. THis is very unique and I will have to try it. i'm sure this dish wud have tasted good but the arrangement on the plate looks awesome more than anything else!! Hey! isnt this the same as aaloo poha? wht a lovly dish dear..drooling heree.. Such a colourful and healthy biriyani. Looks delicious! wow, this is such a nice variation ..
very unique Idea. Nice recipe. Biryani looks different and yummy. Ur green chilli pickle making me home-sick. I wish i have aaloo paratha with that pickle. Lovely colorful dish. Poha spiced with all the masala, must have tasted yumm. It looks so colorful and yummy!I did not know you get Soya flakes.. The biryani looks really good! Healthy and very creative. Award time..Pick it up from my blog and you have been tagged! looks really yummy Prathiba. love the pics. Hummmm very nice entry, delicious !!! That is a healthy and innovative version of biryani. Got a surprise for you at my blog..
Never heard of this dish! Interesting combo.. lovely idea with raita in a capsicum! Hi Prathy, Long time, no post,no news. Hope everything's alright with you.